For many of us, this year will be remembered for its weather. The January blizzard and record winter snowfalls. The mind-boggling flooding that followed Hurricane Irene and Tropical Storm Lee. The wild Halloween snowstorm and its ensuing power losses. We were reminded that things we take for granted—like the rich productive farmland soils that have been farmed for centuries along the Deerfield River in Massachusetts—can disappear in a day down a river. We were reminded, too, of how important it is to have effective programs and policies in place to help farmers manage the inherent risk in farming so they can stay profitable and remain stewards of our vital working landscape. With the Rhode Island Agricultural Partnership, we presented a new strategic plan for the state’s farms to Governor Lincoln Chaffee and state lawmakers at Rhode Island’s Agriculture Day in May. The new five-year plan, A Vision for Rhode Island Agriculture—the culmination of a year’s outreach to Rhode Island’s diverse agricultural community—will guide consumers and officials in building a stronger and more resilient food system and farm economy. Faced with some of the highest farm real estate values in the country, farmers in Connecticut—especially those just beginning—often struggle to find productive and affordable farmland. 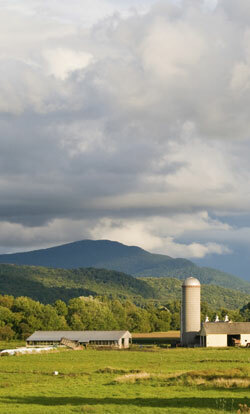 Farmland ConneCTions: A Guide for Connecticut Towns, Land Trusts, and Institutions Using or Leasing Farmland, published by American Farmland Trust and the University of Connecticut, helps towns, institutions and land trusts navigate the process of leasing land to farmers or managing it for agricultural use. With new governors in four of the six New England states, we worked to educate incoming administrations about the importance of state and federal funding for farmland protection, including—through the Working Lands Alliance—Connecticut governor Dannel Malloy. We were thrilled when Gov. Malloy and state lawmakers enacted a two-year bond package with $20 million for farmland protection, allowing continued progress toward the state’s goal of protecting 130,000 acres. In partnership with Maine Farmland Trust and the Mainewatch Institute, we produced a new guide to give communities practical ways to support local farms and keep farmland in farming. Cultivating Maine’s Agricultural Future provides examples of actions local officials and residents can take to protect farmland and make their towns more farm-friendly. Please contact Peggy McCabe in our New England Office at pmccabe@farmland.org for a free printed copy of the guide. New England’s 14 million consumers are demanding more locally grown foods, and the region’s institutions—including public and private schools, universities and hospitals—are looking for ways to meet that demand. This year, we were excited to help launch a new effort, the Farm to Institution in New England (FINE) project, taking a region-wide approach to expanding processing capacity, identifying distribution channels and best practices, and increasing institutional procurement of New England-grown foods. Agriculture is rooted in New England’s history and is a critical force in guiding the region’s future. As we look to 2012, we will continue to work to support thriving farms throughout New England while improving access to healthy foods and growing the resiliency of our region’s farm and food system. This entry was posted in Connecticut, Farmland Protection, Local Farms and Food, Massachusetts, Rhode Island, Vermont and tagged community, farm to institution, Farmland Protection, local food, planning for agriculture, public health on December 8, 2011 by Cris Coffin.